1937 saw the introduction of the AD32, which was built to sell as cheaply as possible, and certainly achieved that aim by retailing for just £8.5.0. It must be remembered that the cheapest Universal receiver from the previous year retailed for £10.2.6, making the AD32 about 20% cheaper. It was only available in the AC/DC variant and also included a large tuning scale with station names marked for the first time. The set was also notable for having been formed from a single piece of plywood, which had been bent from the top to the front under pressure. The cabinet was designed by R.D. 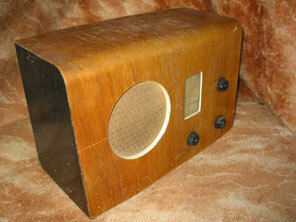 Russell, and to save money the sides were not veneered but stained to black. The set was fairly basic, and unlike previous sets did not have a tone control. 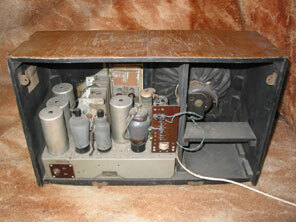 This was the last year when sets featured knobs held in position by threaded nuts (see Murphy 1934 receivers). Shown below is a warning label pasted to the underside of the cabinet. As the AD32 was a Universal set, in certain circumstances there was a risk of electric shock from the chassis fixing bolts should they be touched. 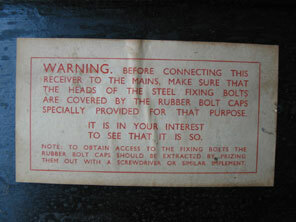 The label was to advise owners to ensure the bolts were covered in an insulating material. However the warning is really rather vague, having advised owners to ensure the bolts are covered, it continues "It is in your interest to see that it is so". Surely stating the risk of electric shock would have been far more effective! Valve line up was TP2620, VP1322, PENDD4021, U4020. January 1937 is also notable as the month of the fateful board meeting in which Frank Murphy resigned from the business. However, with just seven years of the Murphy story told so far the progress that the company made with Frank Murphy as the driving force is a testament to his ideas and constant striving for quality combined with value-for-money.